A mop is a device used for cleaning floors, consisting of an absorbent material, such as a sponge, fastened to a handle. A thick mass of hair is also called a mop. To mop, as a verb, means ‘to clean or wipe with a mop,’ or ‘to clean as if with a mop,’ even if you don’t actually use one. Unrelatedly, to mop means ‘to make an unhappy face,’ usually in the expression ‘to mop and mow,’ and the noun mop is an unhappy face. These last two meanings are rare now, but you might come across them in some old books. It's easier to clean the whole floor with a mop than just a cloth or a scrubbing brush. The politician was famous for his unruly mop. Eugene mops the floors at least once a week. The fastidious woman grabbed a cloth and desperately mopped at the spreading stain. The unhappy child was mopping and mowing. Everyone was heartily tired of the old woman's mops. MOP is also an acronym for a few different things, including the currency of Macau, which is called the Macau Pataca. 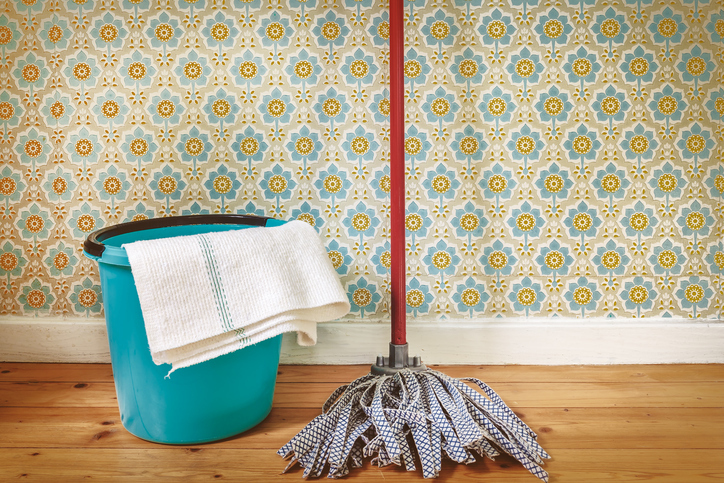 In the late 18th century, the slang term mopsqueezer was used to describe a female servant, especially a housemaid. Mop, the implement for cleaning, dates back to the late 15th century. The late Middle English noun mappe meant ‘a bundle of yarn, string or cloth tied to a stick for cleaning or for spreading pitch on the deck of a ship.’ It came from the Walloon (French dialect) mappe (napkin), which came, in turn, from the Medieval Latin mappula (piece of cloth) and the Latin mappa (napkin), which is also the origin of the word map. The modern spelling was fixed in the mid-17th century. The verb comes from the noun, and dates back to the early 18th century. The unrelated meaning of mop, ‘to make an unhappy face,’ dates back to the late 14th century. The late Middle English was mappel (later shortened to mappe). Its origin is unknown, but most think it comes from a Germanic or Nordic language. It is related to the Dutch moppen (to pout), the Low German mopen (to sulk) the Danish maabe and the dialectal Swedish mopa (to mope), as well as the similar English verb mope. The noun comes from the verb, and appeared in the early 15th century.